Label design software enables you to design professional looking labels quickly and easily. 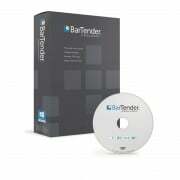 LabelDirect or Seagull Scientifics Bartender software are the best in class label print and design software packages. We have basic and professional packages available depending on your requirements.